Sugar cookies are the ultimate Christmas cookie. Learn how to make the best homemade rolled, cut out, and frosted sugar cookie recipe ever! 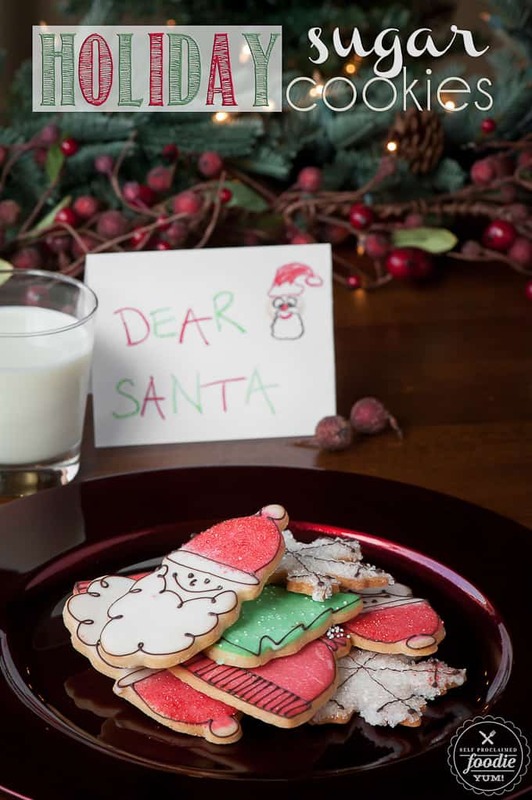 No Christmas season is complete without these mouthwatering Holiday Sugar Cookies that are not too soft, not too crisp, perfectly sweet, and loved by all. Pin it to your CHRISTMAS COOKIE BOARD to SAVE it for later! 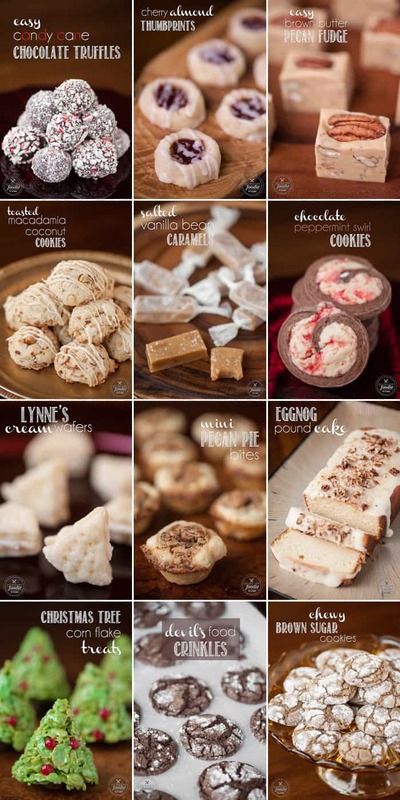 Can you think of a better treat to eat around the holidays? 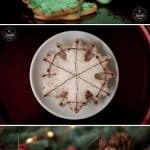 Making sugar cookies has been a long time tradition of mine, much like making microwave fudge and our favorite monkey bread recipe, and the process got a hundred times more enjoyable when I had kids to share them with. I make a pretty mean sugar cookie. Not only are these cookies super cute, but they are the best damn tasting sugar cookies I’ve ever eaten. They’re perfect. 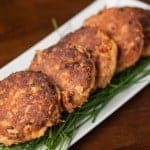 They have just the right amount of soft texture without tasting crisp or chewy. Let me tell you everything you need to know about making the best sugar cookies! As with any cutout sugar cookies, they’re not difficult to make. You just need to have the patience to go through each of the steps: mix, chill, roll, cut, bake, decorate. I love every second of this process, and my kids love making them with me. First step is to mix the cookie dough. You’ll start by creaming the butter and sugar together until light and fluffy. You can’t overmix this part of the recipe. Next you’ll add the liquids and mix just until combined. You’ll probably need to scrape the bowl a few times to get everything incorporated. Finally you’ll add your dry ingredients. Go ahead and add them all at once, mix on low speed just to get them worked in, then crank up your mixer to full speed for just a few seconds to fully incorporate all the ingredients. Finally, you will tightly wrap all of the sugar cookie dough in plastic wrap and refrigerate for at least 1-2 hours. More details below on how to finish the process! After your dough has chilled, its time to roll out the sugar cookie dough, make cut out cookies, and bake them. Opinions may vary on this subject, but I think 1/4 inch is the perfect thickness for sugar cookies. 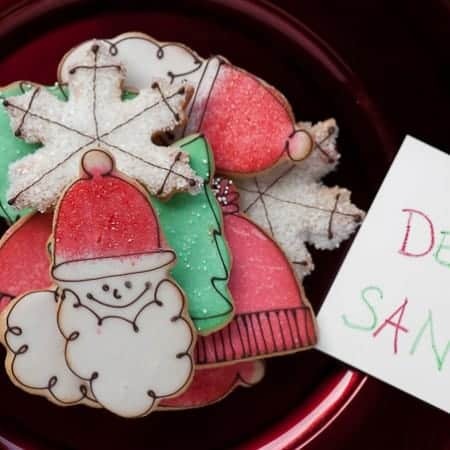 A quarter inch will give you sugar cookies thick enough to hold up to the decorating process, but they are still thin enough to cook all the way through. 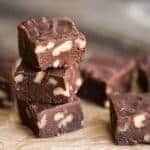 The main consideration when rolling out your sugar cookie dough, however, is to ensure that you are rolling all of the dough to the same uniform thickness. The last thing you want is to have some of the cookies burn and some to not cook all the way through. Ever make homemade sugar cookies and the dough looks great when you set in in the oven. Then, when you take the cooked sugar cookies out of the oven all of those wonderful shapes have disappeard? 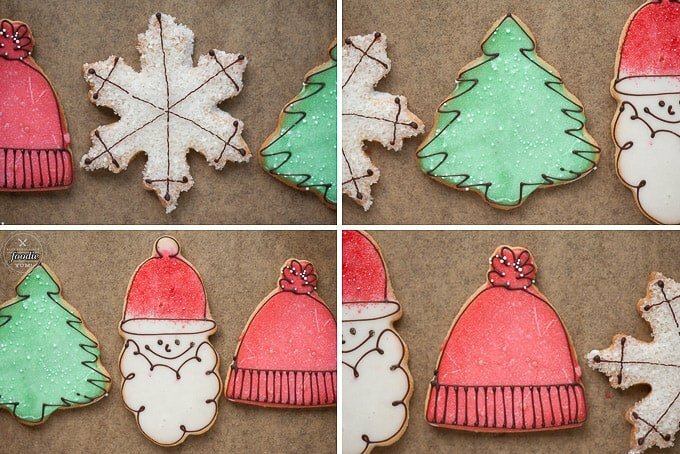 Well, there are a few tricks to getting your sugar cookies to keep their shape. Most importantly, your sugar cookie dough needs to be cold when it goes into the oven. This means that any dough that is not currently being rolled out should be kept in the refrigerator. This also means that you shouldn’t put your cut out sugar cookie shapes on the cookie sheet until they are ready to go into the oven, unless you have a cold spare cookie sheet ready to go. In the past I would always use only two cookie sheets. That means I would prepare my cut out sugar cookies while another batch is cooking. That would result in me putting the sugar cookie dough on a hot cookie sheet (from the previous batch). It wasn’t until I started using extra cookie sheets that my sugar cookie dough was able to maintain its shape. Secondly, high quality cookie cutters that have a somewhat sharp cutting edge will help the sugar cookies maintain their shape while they cook. If you plan to only use sprinkles, you’ll want to add them to the sugar cookie dough prior to baking so that they will adhere to the cookie as it bakes. You can even gently press the sprinkles into the sugar cookie dough prior to baking. If you wait to add the sprinkles until after the cookies are baked, they won’t stick. If you plan on frosting or glazing your cookies with icing and using sprinkles, you’ll do that after they bake. 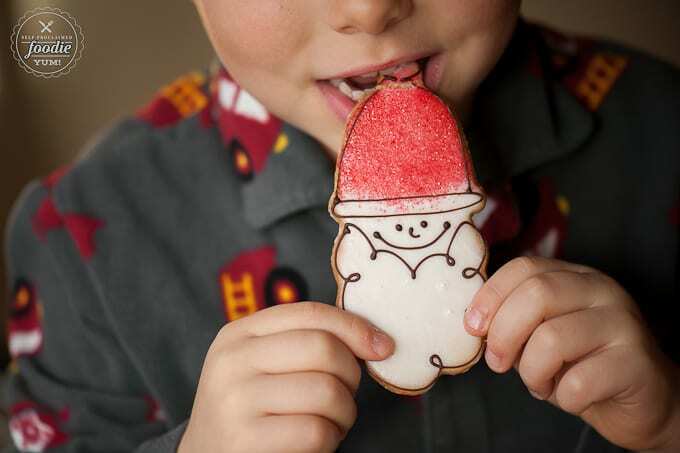 There are a few main options to decorate a homemade sugar cookie. You can choose to use sprinkles, glaze, frosting, royal icing, or a combination of any of those. The quickest and easiest way to decorate a sugar cookie is to add sprinkles before they bake and be done with it. The most delicious way, in my opinion, is to decorate your sugar cookies with a thick layer of frosting and sprinkles. Not the prettiest solution, but boy do they taste good! The icing on top gives just the right amount of sweet to make you want to reach for another (and another and another). 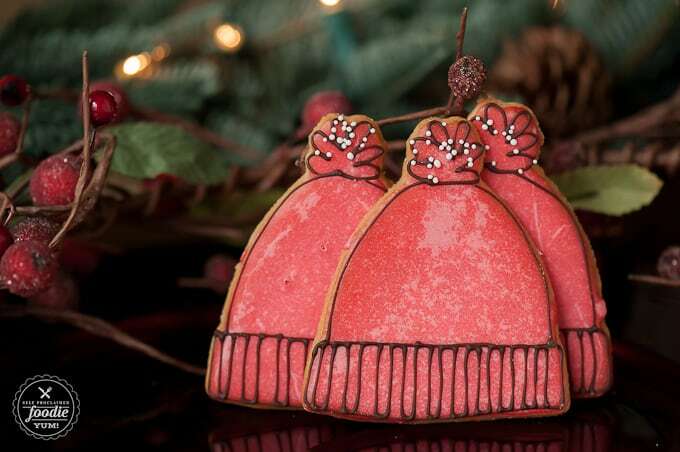 There are a few ways to go about icing your homemade sugar cookies. If you have the time, patience, and a halfway decent creative eye, the absolute best way to decorate your homemade sugar cookie with with glaze and royal icing. Sugar cookie glaze is a simple mixture of melted butter, water, and powdered sugar. It can be tinted with food coloring if desired. Simply dip your baked sugar cookie into the glaze and it will dry hard. 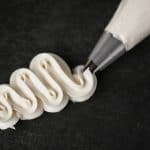 Royal icing is great for piping lines or borders. If you pipe a border of royal icing first, you can spoon on your glaze and flood the cookie. Royal icing is a combination of egg white and powdered sugar. It dries hard but must be kept in an airtight bag to keep it from hardening. How long will decorated sugar cookies last? In my house? Not long. I always think homemade sugar cookies taste best within the first day or two. Don’t get me wrong. I’ve been known to eat them long after that time period, but like any homemade cookie, they’ll start to go stale if left out. 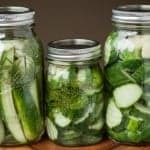 They will keep for some time, though, if kept in an air tight container at room temperature. If you’re not planning on eating your freshly made sugar cookies right away, my recommendation is to freeze them until you’re ready to eat them. 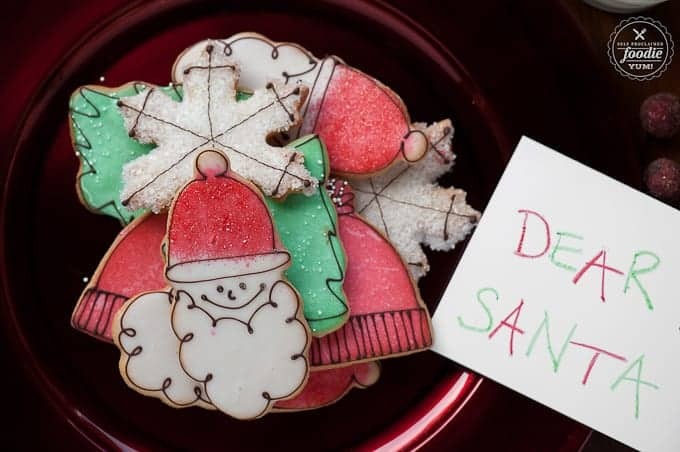 Can you freeze decorated sugar cookies? Absolutely! 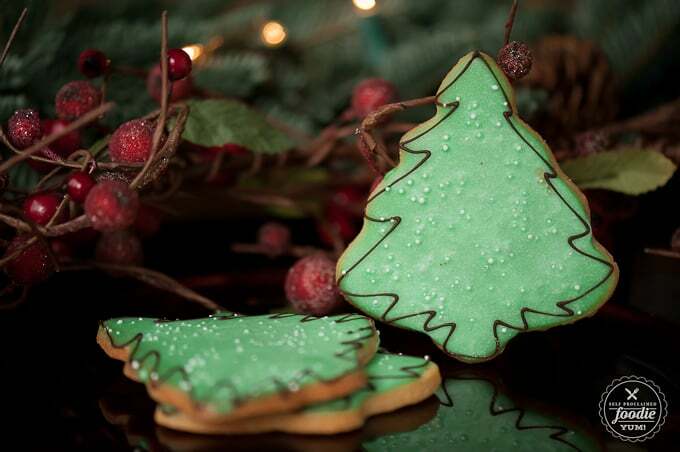 Just make sure your sugar cookies are fully cooled and the frosting or icing is completely dry. Then, you can gently set your cookies in an air tight container and store them in the freezer. If you need to stack them, a layer of parchment paper in between will keep them nicely separated. It was fun to watch my kids decide which cookie to eat first. “I want the Santa. No, I want the hat. 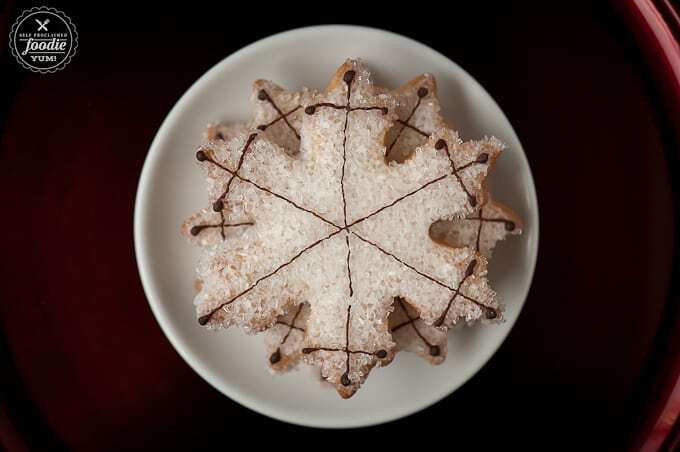 Wait, I want the snowflake. Wait wait wait, I want the tree”. Yeah, their heads pretty much exploded when given the choice which cookie to eat first. But as you can see from those big beautiful puffy cheeks, the cookies put a big smile on their faces! Sugar cookies are the ultimate Christmas cookie. Learn how to make the best homemade rolled, cut out, and frosted sugar cookie recipe ever! Add the dry ingredients all at once. Mix on speed 1 just until the dough starts coming together. Give it a 5 second flash on a medium-high speed, to insure the mixture is homogeneous. Wrap the dough in plastic wrap in a puck shape. Chill for 1-2 hours. Preheat oven to 350 degrees F. Prepare a baking sheet with a Silpat or parchment paper. On a lightly floured surface, roll out the dough to 1/4 inch thickness. Cut into desired shapes with cookie cutters. Place cookies 1 inch apart on the prepared cookie sheets. Bake for 8-12 minutes in the preheated oven, until bottoms and edges of cookies are light brown. Remove from baking sheet and cool on wire racks. Melt the butter and water together over a double boiler. When the butter is melted, remove the double boiler from the heat, but keep the double boiler in tact. Add the powdered sugar all at once. Stir with a whisk, pressing the whisk against the sides of the bowl to press out the lumps. When all your lumps are worked out, add more water, 1 teaspoon at a time (if needed) until the glaze reaches your desired thickness. Add food coloring as desired. In a mixer, whip the egg white in a clean bowl until it starts to get foamy with soft peaks. Add the powdered sugar all at once. Whip on a slow speed until fully combined. Use immediately or cover with plastic wrap directly on the surface of the icing. Dip the tops of your cookies in the warm glaze and allow them to fully dry before applying royal icing. If adding sprinkles or sugar, be sure to sprinkle on while glaze is still wet. Likewise, you can pipe a border of royal icing onto the cookie, allow to fully dry, and then flood the center with warm glaze. Serving size based on one cookie. Estimated total quantity of recipe is 4 dozen cookies, however that can vary depending on thickness of dough and size of cut outs. This post was originally created in November 2014 and has been updated with more fun facts and tidbits for your reading pleasure. 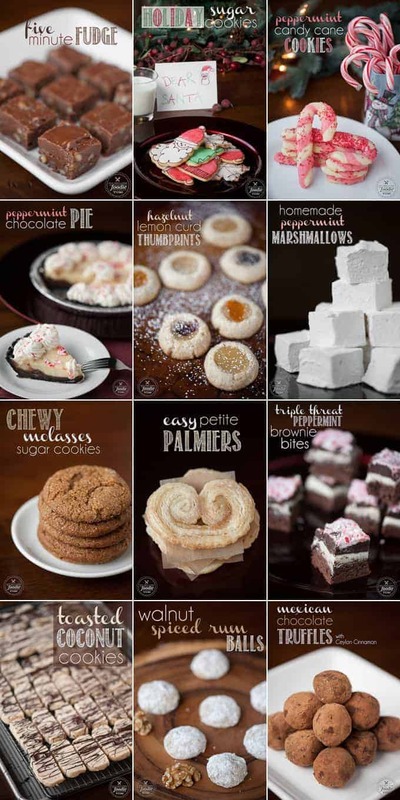 I am gearing up to make dozens of Christmas cookies this year and plan to try your Candy Cane and Sugar cookies. Question: Can the dough be frozen for a month. If not, will the undecorated cookies freeze well for a month? Hi Linda, I think both the dough and baked cookies would freeze just fine for a month as long as they are wrapped air tight. Enjoy! I’m obsessed with sugar cookies. And I love the way your decorated these, super cute! I always have trouble with the dough sticking when I roll it out, but these turned out great! Thanks for all the tips. Okay these are adorable!!! Thanks for sharing! I am so excited about this sugar cookie recipe! I bet you could freeze it and bake cookies whenever.